Gulab Jamun can be prepared in many different ways. However, the easiest and quickest way to make soft, melt in the mouth, dry fruits and saffron stuffed Gulab Jamun at home that tastes as good as ones made from Khoya is by using the ready mixes like ones from Gits, MTR, Ashirwaad etc. Preparing Gulab Jamun with ready mix not only reduces the preparation time but also allows you to learn the delicate cooking skill of having the right sugar syrup thickness, dough consistency and deep frying jamuns over medium-low flame which are crucial cooking steps for making perfect Gulab Jamuns at home (all these tricks are explained in detail as part of directions). The delectable filling of dry fruits and saffron gives Gulab Jamuns prepared with this recipe a “Shahi” touch (royal look and flavor) that you usually only get to see in the ones bought from sweet stores. 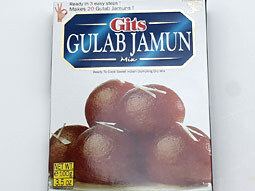 We have tried many different brands of Gulab Jamun ready mixes but our favorite is the Gits brand and is used in this recipe, however you can replace it with any well known brand’s ready mix available in your grocery store. 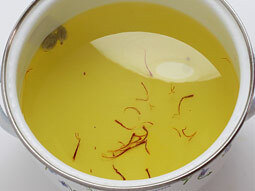 Take 1½ cups sugar, 4 green cardamom pods, 8-10 saffron strands and 2½ cups water in a deep pan. Stir until sugar dissolves and bring it to boil over medium flame. When it comes to rolling boil, reduce flame to low and cook it until syrup turns little sticky, it will take around 10-12 minutes. When syrup is ready, turn off the flame. Open the packet and transfer its content to a wide mouthed bowl. Sprinkle 3 tablespoons of milk evenly over it. Mix it together gently using your hand. Do not worry if mixture turns sticky. 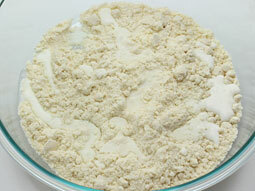 Knead the mixture into smooth and soft dough. 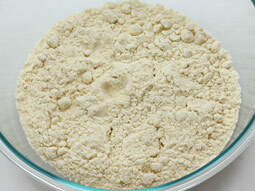 If mixture turns dry, add few tablespoons of milk and knead again. Prepare the dry fruit and saffron stuffing. 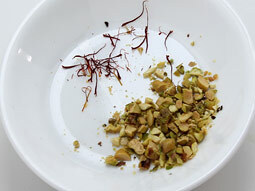 Take chopped pistachio and saffron strands in a small plate. This is an optional process and you can skip this. 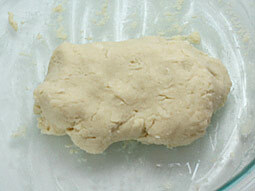 Divide dough into 18-20 equal sized small portions. Take one portion and make a round shaped ball from it (Grease your palms with ghee or oil to prevent dough from sticking to your skin while making balls). Press it a little between your palms and give it a flat pattie like shape as shown in the picture. 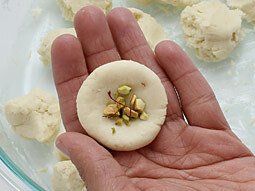 Put a 5-6 pieces of chopped pistachio and a strand of saffron in the center. Fold together edges such that it wraps the filling around it and make a round shaped ball from it. Make sure that ball has smooth surface. Make remaining balls in a same way. 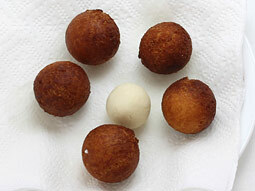 Cover the balls with wet cloth while you are making balls from remaining dough portions to prevent them from drying. While you are making the balls, take oil/ghee in a deep frying pan and put it to heat over medium flame so that when you are done preparing balls, oil will be almost ready for deep frying them. Before proceeding to deep fry them, check whether oil/ghee is hot enough for deep frying – drop a small portion of mixture in oil and if it comes on the surface immediately without changing the color, oil/ghee is ready. If it turns brown immediately then oil is too hot and you need to reduce the heat to let to cool a bit, if it drops to the bottom, you need to heat it a bit longer. Add 3-4 balls in hot oil from the side and deep fry them over medium-low flame, stir occasionally to get even golden brown color on all sides. If required, increase or decrease the flame to low or medium to maintain the even temperature and deep fry evenly. Drain jamuns using slotted spoon and transfer them over kitchen napkin on a plate. Let them cool for 4-5 minutes before adding them to sugar syrup. As you can see in the picture, the size of the the jamuns increases after deep frying. Deep fry the remaining balls. Warm the sugar syrup by heating it over medium flame for around 4-5 minutes. Turn off the flame and add deep fried jamuns in it and keep them in syrup for at least 1-2 hours before serving. In photo you can see how the size of jamuns deep fried in the first batch has increased compared to the ones deep fried in the second batch (two small jamuns near top of the photo are from second batch). Notice the size of jamun at different stages of preparation – raw, after deep frying and after absorption of sugar syrup. 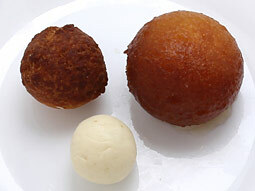 Gulab Jamun with ready mix can now ready for serving. Serve it warm or put them in the refrigerator and serve chilled. Mixture should be soft in step-7 to make soft jamuns. 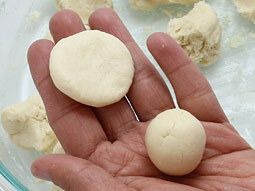 If dough turns dry while making balls, add few tablespoons of milk in it and knead again. Sugar syrup must be warm (not hot) when you add deep fried jamuns in it. Allow jamuns to cool for 5-minutes after deep frying before adding them to warm sugar syrup. Have patience while deep frying as it will take sometime to cook and turn dark brown over low-medium flame. Use ghee instead of oil to get the authentic flavor. If you want prefer oil over ghee for deep frying, consider adding 2-3 tablespoons ghee in oil to get its nice flavor without its calories. You can skip stuffing them with dry fruits; it’s an optional process. 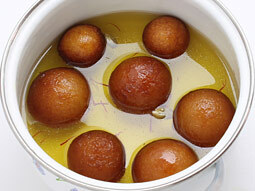 Serving Ideas: Serve chilled Gulab Jamun as a dessert or as a sweet dish. Warm Gulab Jamuns and scoop of vanilla ice cream is a match made in heaven. My sugar syrup was too sweet how to reduce the sweetness after dipping gulab jamuns in it. Response: Follow the given steps to reduce the sweetness of sugar syrup. 2. Add water in sugar syrup and reheat it until it comes to a boil. Let it boil for 3-4 minutes over medium flame. 3. Remove the syrup from the flame and let it cool at room temperature. 4. Add jamuns in cooled syrup and wait for 2-4 hours before using them. How much quantity should we use for 200 peoole per person 2 jamuns, can u tell the grams of jamun mix? Response: Hello Divya, this recipe uses 100 gms ready mix pack for 20 jamuns, so for 200 people(2 per person, 400 jamuns) use 2 kg ready mix. Can I use more milk to make the dough. Please also tell me the sugar quantity in grams and water quantity to make gulab jamuns for 200 grams mix. Thanks for it. Response: Yes Anita, you can use more or less milk as needed to bind the soft dough. To make jamuns from 200 grams ready mix, use 600 grams sugar(3 cups) and (1 litre + 250ml) water (5 cups). Response: Hi Kausar, we will try to do that. Please send Food receipies to the above account.. Response: You can sign up for the new recipes notification by Subscribing to our mailing list link available on top right side of the website. 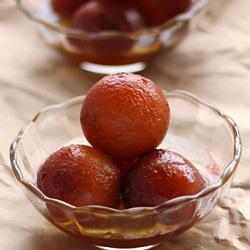 Hi I need gulab jamuns for Saturday...plan to make it on friday. Do I need to referigerate it or can I just fry it and keep..prepare the sugar solution on Saturday and add it to the solution? Response: Hello Anita, you can make jamuns on friday and keep them in refrigerator (jamuns with sugar syrup). I tried making gulab jamuns using gits with this same recipe but when I tried to fry them, they turned dark brownish black. The color was too dark so I took them out but they were not fried at all from inside. They were all raw from inside. I thought maybe the flame was high so the oil was too hot and hence I tried it some other day with low-medium flame but still the same problem. Response: Hello Nimrat, the main reason behind the problem is the temperature of oil. Make sure that the oil is not too hot while adding the jamuns into the oil. Use a heavy based frying pan to maintain the even temperature while frying. I hope this will hep you. How many packets of GITS do I need if I wanted to make 140 Gulab Jamuns and how in what quantity the syrup is required ? Would be really Thankful to you. Response: 100 Gms pack makes about 20 Gulab Jamuns. To make 140 Gulab Jamuns, you need to use 7 packs of 100 gms each. You need to multiple all ingredients by 7 to make 140 Jamuns. I tried for the first time preparing gulab jamun. Some of them were cracked. I should try for the second time and see if it will crack. Please forward the video if any to make it success. Response: If the raw jamun balls have cracks on the surface, it means the dough has not enough moisture. 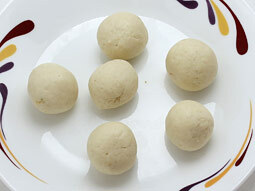 Add little bit more milk in the dough and make the raw jamun balls to prevent the cracks. To prevent them cracking while deep frying, make sure that the oil/ghee is MEDIUM hot at the time of adding the jamuns. After adding the jamuns deep fry them over LOW flame. I got perfect jamuns for second time in a row.Thank you for the recipe. But I made small changes. I mixed the dough with enough milk so that the dough is wet. It keeps the jamuns from dying up and we can cook syrup and heat the oil after making the jamun balls. Also I increased the water content in the syrup since my family doesn't like too much sweet and thick syrup.So I added 3 and a half cup of water. 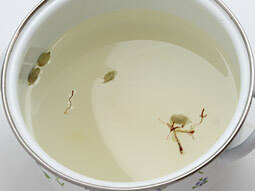 Response: Thank you Roopa for trying the recipe and sharing the wonderful tips. I cooked very well gulab jamun, when I ate, they are hard from inside and outside round shape coming out, in future not happened like that what I have to do please advice me. Response: The reasons behind hard jamuns are given below. 1) It happens if the jamuns are not fried at even temperature (medium-low). If the temperature of oil is very hot while frying the jamuns, they will turn brown fast and remain uncooked from inside and because of that they are not able to absorb syrup from inside and turn hard. 2) It happens if the sugar syrup is watery (not cooked enough). If you like the little watery syrup, add the deep fried jamuns in warm sugar syrup (not very hot) after cooling them for 4-5 minutes. 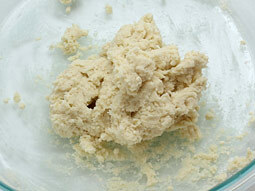 3) Do not over mix or knead the mixture while making the dough in step-7. I hope this will help you while trying the jamuns next time. Simply awesome. I don't have more words to explain my feeling about the way she explained about the same. 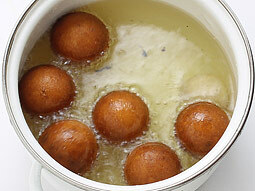 While frying Gulab jamun, why do they get cracked? Wht is the solution for that? Response: Thank you for trying the recipe. I have posted the answer in the below given comment regarding cracks. I got cracked Gulab jamuns. Response: Thank you Anshu for trying the recipe. It happens if the mixture of making jamun is hard or dry. When you try this next time, make sure that the jamun mixture is soft like roti dough and don't forget to cover the raw jamun balls. Keep the raw jamun balls covered to prevent them from drying and prevent cracks. Thank you soo much! Just finished my 12th and learning cooking! I had a pack of gulab jamun mix nearing its expiry date and I tried it de 2nd time, it was soooo soft!! Response: Thank you Nashara, for trying the recipe. I'm glad to hear that it turned out perfect and good luck for the learning cooking. For how many days it can be kept without fridge? Response: You can keep it for around 5-6 days at room temperature (without fridge). I today only brought the pack of same gulab jammun as you have. It is easy. I will sure make it tomorrow. Thank you for the receipe and must say this website is very good. Please upload more sweets recipe like the cakes sweet cookiez etc.. 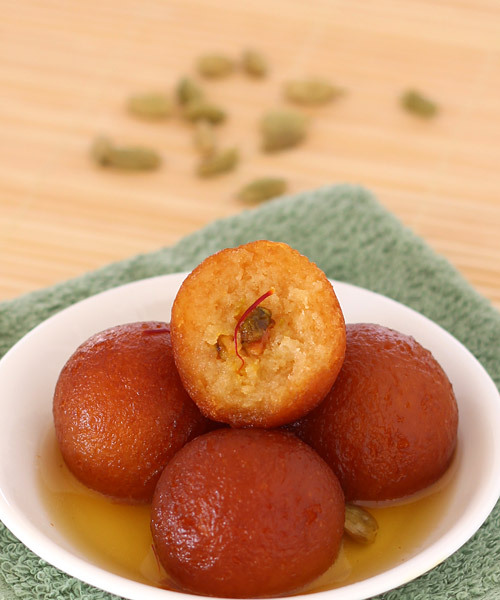 It is quite awesome....love to make this gulab jamun...and I must say very nicely explained. The recipes are very easy and explained nicely. Very nice explanation of procedures, one of the best cookery sites. It was very nice to visit such site I really enjoyed reading this.